Last week I held a competition on RunawayJane.com. All contestants needed to do was simply retweet the link plus title to the competition on twitter to be in with chance of winning a copy of Matt Kepnes, a.k.a. 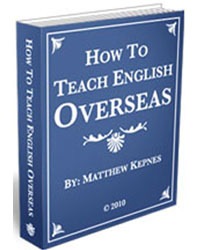 Nomadic Matt, ebook “How to teach English overseas“. Out of all the people who entered, there could be only one winner. Picking from random this morning, I am pleased to congratulate Lauren @NEFootsteps as the winner of this first competition on RunawayJane.com. I will be getting in touch with Lauren today to arrange for her copy to be sent to her. If it’s freebies you are after however, and you want to be in with a chance of winning some prizes on RunawayJane.com, be sure to subscribe to the RSS Feed as I will be announcing more competitions shortly!